I treated myself to a Liz Earle Daily Essentials set from Boots back in November. I'd read about it in so many blogs, and as I've said before, I'm a sucker for hype. The Hot Cloth Cleanser is a firm favourite in the blogging community, and there's obviously a reason for that, so I had to have it. A little bit goes a long way with the cleanser, and I find that two short pumps are enough to cover my face (Hah, phrasing). I use this with my Pulsaderm buddy. I won this at the Liverpool blogger event, and it's awesome. It exfoliates beautifully and leaves my skin feeling tingly and squeaky clean. After I use the Pulsaderm, I wipe off any cleanser left with a muslin cloth. I use the toner from the Liz Earle set. Pour a small amount on to a cotton wipe, wipe it on my face and neck and I'm good to go. You can also get this in a spray bottle, which is perfect for freshening up during the day. I leave it for about five minutes to let the toner sink in. As you'll have probably guessed, I use the Liz Earle moisturiser. Again, a little bit goes a long way, and I only use one pump, two if my skin is particularly dry. This step is pretty straightforward, I guess. Don't be pulling on your face though. Rub in the moisturiser in an upwards motion. I really enjoy a good face mask. Lately I've been alternating Cup O' Coffee and Mask of Magnanimity by Lush. I use Cup O' Coffee when my skin is particularly dull and in need of a good exfoliation. Mask of Magnanimity is relaxing, yet refreshing and perfect for a lazy Sunday. I really like peppermint and it helps control my oily patches and blemishes. I love trying out new cleansers, and I have since bought Lush's 9 To 5 cleanser, another cult favourite. I like giving new skincare a few weeks before I make an opinion, so maybe you'll hear about that in the next few weeks. What's your skincare routine like? Do you have any favourites I should know about? 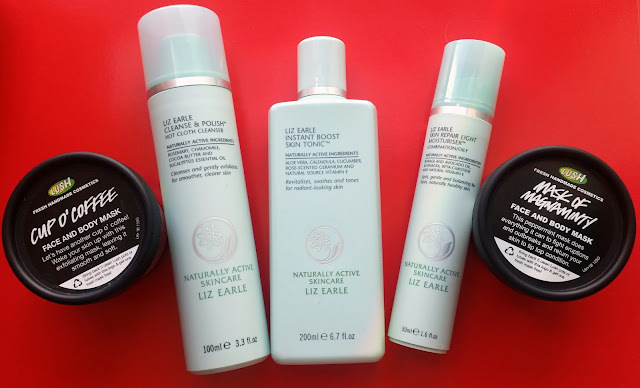 You've just inspired me to start using my Liz Earle products again! I forgot how much I love the toner.